Pick any product you’ve purchased and write a review. Not only will you be helping others make decisions when shopping, you’ll be instantly entered into our monthly “Product Review Sweepstakes” for a chance to win $500! The more reviews you write, the more chance you’ll have to win! Step1: Sign in to your account or register with DesignerLiving.com for free. No Purchase or payment of any kind is necessary to enter or win this Monthly Product Review Sweepstakes (Sweepstakes). A purchase will not increase your chances of winning. 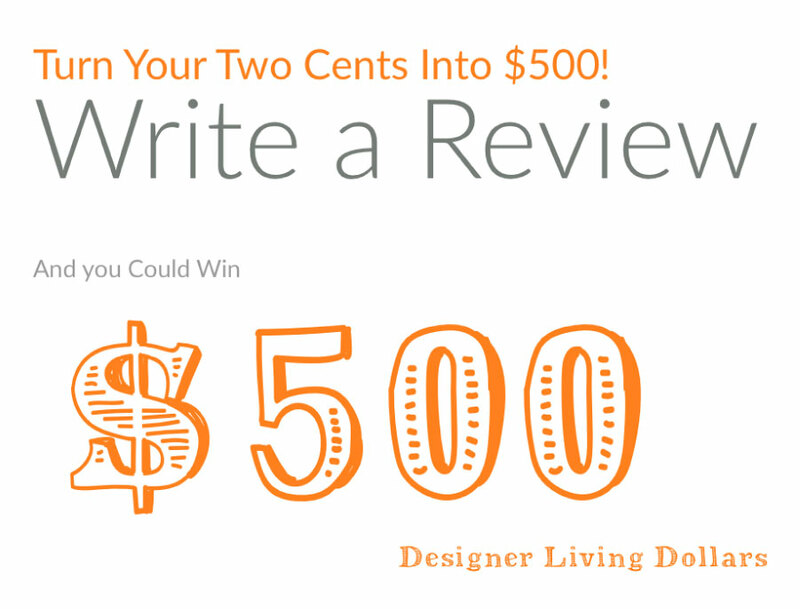 The following rules and regulations apply to the Designer Living Monthly Product Review Sweepstakes offered by Designer Living Inc. (Sponsor) Sweepstakes begins at 12:01 a.m. ET on August 1, 2011 and this is a monthly recurring event until Designer Living decides to terminate. A monthly winner will be randomly drawn on 1st of each month and a notification email will be sent to the winner. Log on to DesignerLiving.com and either sign in if you are already a registered customer or register with DesignerLiving.com. 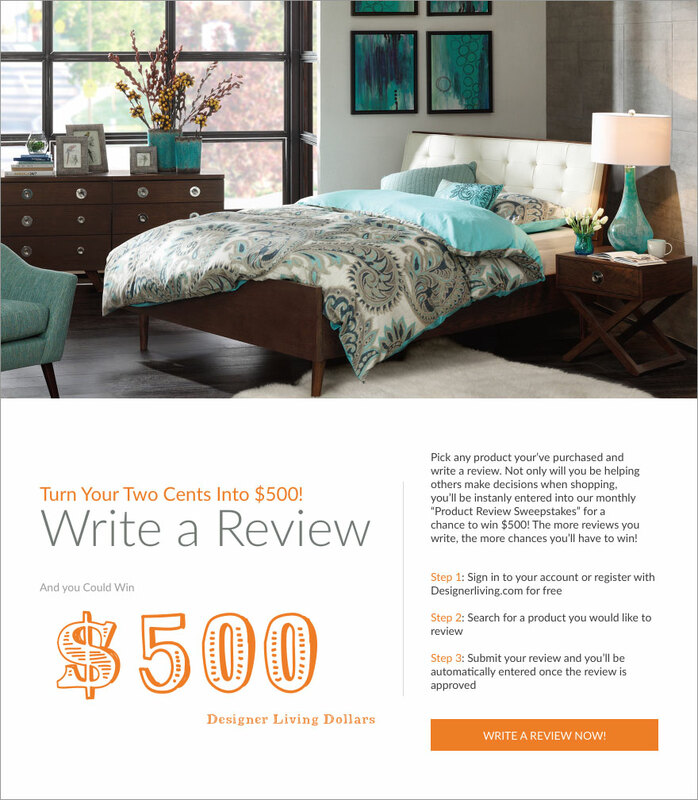 Then, review a product on DesignerLiving.com and you will be automatically entered into the Sweepstakes. You may review as many products as you wish and each product review will constitute one (1) entry. Product reviews which contain obscene, lewd or offensive language will be disqualified. Entries will be deemed made by the authorized account holder of the e-mail address submitted at the time of entry. Sponsor is not responsible for entries that are lost, late, garbled, damaged, illegible or otherwise deficient or incompletely received for any reason. Sponsor is not responsible for any typographical or other errors in offer, administration of the award or in the announcement of the prize. Sponsor, in its sole discretion, reserve the right to disqualify any person tampering with the entry process or otherwise in violation of the rules. Sponsor further reserves the right to cancel, terminate or modify any promotion not capable of completion as planned, including by tampering, unauthorized intervention or force majeure. Sweepstakes is open to legal residents of the 50 United States, the District of Columbia and Guam who are 18 years of age or older as of the date of entry, except employees of Sponsor and its affiliates, subsidiaries, advertising and promotion agencies and their immediate family members and/or those living in the same household of each are not eligible. Sweepstakes is void in Puerto Rico and where prohibited by law. One winner will be selected in a random drawing on or by 1st of each month. All decisions of the judges are final. Odds of winning will be determined by the number of eligible entries received. One (1) Prize winner will receive a $500 DesignerLiving.com's gift card via an email. Retail value of prize is $500. All fees, federal, state and other taxes relating to the use, acceptance and possession of the prize are the sole responsibility of the winner.